One of Europe's crown jewels, Austria delivers unforgettable holidays. The incredible scenery is created by the majestic Alps, serene lakes, forests, and cities which breathe culture. Nothing is more impressive than a beautiful, ancient, castle or a typical alpine hotel nestling in a pine forest with a backdrop of driven snow. These can be your holiday homes in Austria. There is so much to completely fill your days; alpine sports to suit all standards; walks and journeys around mountains and lakes and visits to the historical cities and spa towns. The capital, Vienna, is magnificent with its ornate Opera House and the imperial Hofburg. Austria's other cities match the historical and architectural magic, notably Mozart's birthplace, Salzburg, with its stunning baroque churches and Innsbruck, in the centre of Austria's Alps. There is an abundance of the highest standard restaurants, cafes, taverns, and beer gardens to enjoy during the day and evening. Après- ski is well catered for with trendy clubs and dance venues. Here is Europe at its best and most beautiful. 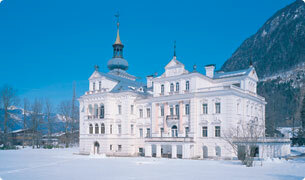 The luxurious holiday apartments at Schloss Grubhof lie in the idyllic Austrian Alps between Salzburg and Kitzbühl. From here you can reach Zell am See in 20 minutes by car. 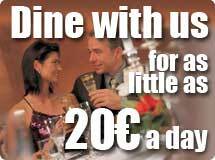 Lofer is a lovely village with several good restaurants, bars and cafés. In the winter Lofer is the preferred starting point for skiers, and in the summer it is the ideal starting point for trips to the lakes or into the mountains. The lovely holiday apartments are situated in the old castle, built in the 14th Century. 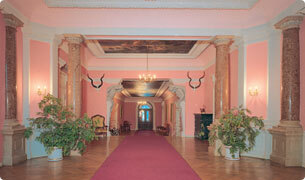 Once the property was owned by the King of Bavaria. Guests are accommodated in a choice of studio units sleeping two; one bedroom units sleeping four and two bedroom units sleeping six. All have kitchenette, central heating, television, radio and telephone. There is a restaurant and billiard room in the building and sundecks for relaxation are situated in the grounds. The resort is a base for skiing in the winter sports season and exploring the region's lakes and mountains at other times of the year. Alternative activities include: Fishing, indoor Swimming Pool, Casino, Shops and Horse Riding.